Lock in a great price for InterContinental Berlin – rated 8.9 by recent guests! The breakfast was wonderful. The staff was very kind. Friendly staff and excellent facilities. Outstanding breakfast. Breakfast amazing Spa facilities and indoor pool was a blessing to relax after a day of sightseeing Room was very clean, spacious and comfortable. Great location next to the Zoo. I have never slept so well! The bed is so comfortable. We also had a great view over the park towards Brandenburg Gate so we could watch the NYE fireworks from our room. We went to Berlin for a mini moon and it really was just perfect. The hotel is in an excellent location just a 5 minute walk from the Christmas markets, shops and restaurants. It was clean and accessible to trains. The bathroom was great. Perfect rooms (Got upgraded to Club Room) ! all was Perfect !! InterContinental Berlin This rating is a reflection of how the property compares to the industry standard when it comes to price, facilities and services available. It's based on a self-evaluation by the property. Use this rating to help choose your stay! This high-class hotel in the Tiergarten district of central Berlin features an award-winning spa with a hot tub, sauna area and a swimming pool. Its Michelin-star restaurant, Hugos, offers panoramic views from the 14th floor. The InterContinental Berlin provides rooms with international satellite TV, an iPod docking station and tea/coffee facilities. The bathrooms have heated floors as well as a bath and shower. Free basic WiFi is provided in all areas. The hotel's 3.3 ft² SPA InterContinental is purely devoted to you relaxation and well-being. Offering extensive wellness facilities for a fee, guests can enjoy three different saunas, a swimming pool, hot tub, massages and beauty treatments (all available for a fee). Guests are welcome to relax in the health bar and on the sun terrace. Hugo’s Restaurant features sophisticated décor and gourmet à la carte dishes. L.A. Café Restaurant serves regional Berlin specialties and classic dishes with a contemporary touch. The popular Marlene Bar offers a drawing room ambiance with its comfortable seating and wooden interiors. The InterContinental Berlin is a 15-minute walk from the Kurfürstendamm shopping street and Tiergarten Park. Buses stop just outside the hotel and run directly to Potsdamer Platz. When would you like to stay at InterContinental Berlin? Air-conditioned room decorated in a classic, elegant style. Includes hot drinks facilities, an iPod docking station and a choice of pillows. Public parking is available on site (reservation is not needed) and costs EUR 26 per day. Large, air-conditioned room decorated in a classic, elegant style. 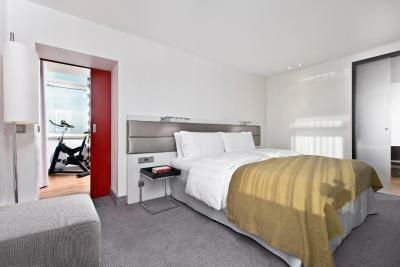 Includes hot drinks facilities, an iPod docking station and a choice of pillows. Junior suite with satellite TV and a seating area. Guests who book this category will have access to the hotel's Club Lounge, which includes breakfast, free drinks at the bar and a snack buffet that changes 3 times daily. This room features air conditioning, soundproofing and flat-screen TV. House Rules InterContinental Berlin takes special requests – add in the next step! InterContinental Berlin accepts these cards and reserves the right to temporarily hold an amount prior to arrival. Please be advised that sauna access is not included in the room rate. Guests wishing to use the sauna facilities will be charged EUR 15. Please be advised that special opening times apply to children at the SPA InterContinental. Please note that breakfast is free of charge for children up to the age of 6 years. Breakfast costs EUR 12 per day for children aged between 6 and 12 years, and EUR 18 per day for children aged between 13 and 17 years. The full breakfast price (EUR 34 per day) applies from the age of 18 years and above. A wonderful experience for my family and me. Extremely courteous staff. Front desk Josefine Schimmel was amazing. The second time I stay here. Everything is good. I have written more in my previous review. That they didn’t have a thermometer! The food at the restaurant wasn’t that great! The Spa, as well as the bed and the arrangement of the bathroom. For my purposes the hotel was a little far from the centre. I would consider a hotel near to `alexanderplatz next time. Like all Intercontinental Hotels it was spotlessly clean with polite, helpful staff. My room was spacious with a pleasant view. The air conditioning in the room wasn't very good. The atmosphere was mild. Unclear tax charge. Complain not resolved. 5 stars are not enough. This place is perfect. Staff is attentive and kind beyond imagination. The place itself screams elegance and class as soon as you walk in. The facilities are endless, from a jacuzzi and swanky onsite bar to little things like free umbrellas when it's raining. The decor itself is absolutely fantastic - at least to my taste. It looks sort of retro-70s-ish and modern at the same time. It doesn't look like it hasn't been upgraded since the 70s. On the contrary! It keeps that retro charm with all the modern amenities and everything looks tastefully refurbished and clean. The room (yes, this is a long post, that's how much I love this place): Heated. Bathroom. Floor. I felt I should start with that. Aside from that, there is a million handy little drawers and gadgets for you to discover, each more clever than the last. Oh and did I mention the walk-in closet?!? All in all, the entire room is so tasteful and pleasant, you will want to stay in all day. Breakfast: I will try to keep it short. E v e r y t h i n g. From Chinese food to a healthy food corner with quinoa and a million other things I can't pronounce. To conclude: I've stayed in quite a few 5-star hotels in my life. But the Intercontinental Berlin is, by far, my all-time favorite. Sorry for the long post. This is me expressing how much I love this place in as few words as possible.